© Knoll Inc. Photograph by R. H. Hensleigh and Tim Thayer. Eero Saarinen once considered pursuing a career as a sculptor. Some critics have suggested that he never strayed far from that path. Some of his most impressive buildings, such as the Ingalls Hockey Rink at Yale, the TWA Terminal in New York, Dulles Airport outside of Washington, D.C., and the St. Louis Arch, possess a decidedly sculptural form, with a free-flowing, curvilinear quality central to their design. In these and other buildings, Saarinen also showed a sculptor’s concern for surface textures and treatments, selecting exterior materials that would best support the rhythm of the design and the function of the architecture. 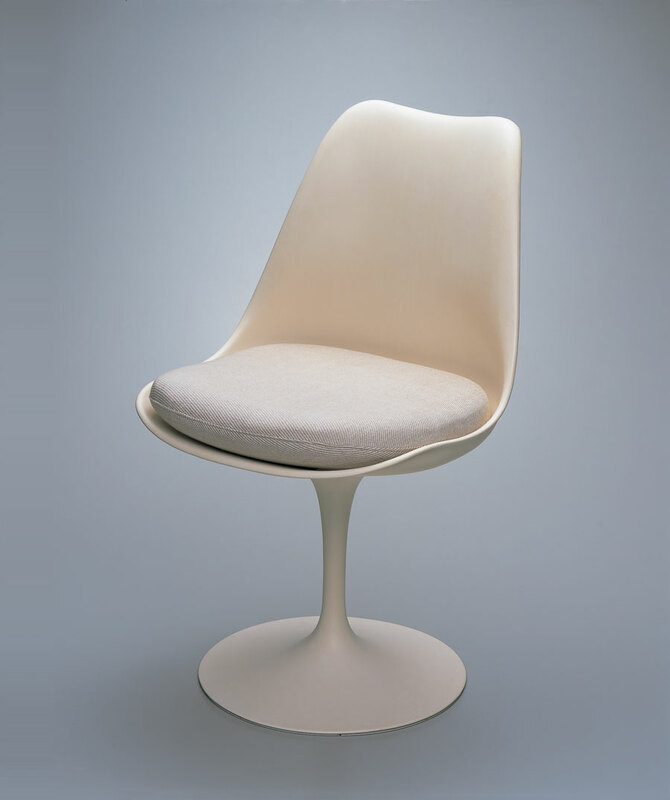 Saarinen brought these same sensibilities to bear on his furniture designs, which he began at Cranbrook in his late teens while working on the Kingswood School project and later broadened at the Academy of Art through his experimentation, with Charles Eames, on molded plywood forms. Saarinen’s pedestal furniture grouping, designed for Knoll Associates in the mid-1950s, fulfilled his quest to eradicate “the slum of legs” that had formerly cluttered the undercarriages of chairs.